Like most colder countries, a well-functioning heating system is an essential feature in any house. How this heat arrives in the house varies, from standalone systems in houses, to district energy systems. In district energy systems, water is heated at a central location, from where it is then distributed to the houses in the area. Denmark has one of the highest coverage by such systems in the world (after Iceland). 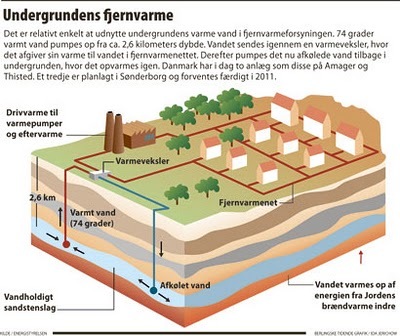 In Sonderborg heating is supplied by Sonderborg Fjernvarme (Sonderborg district heating). To heat most of the water they burn trash. But a new system CO2 neutral system has recently been added to help out in the four coldest months of the year when the heat demand is high. The new system consist of a geothermal system were they dig down around 1-2km until hot water is found in the earth. This 48° C water is then sent to a distribution centre, where it’s sent through heat pumps and hot water is distributed to the houses in the area. In order to transfer the heat from the water pumped from the underground to the water sent out in the district by burning wood chips. The wood is supplied by forest services. An explanation of the system in Danish can be found here. The great thing about Sonderborg Fjernvarme is that it is actually possible to visit and learn about how heat is generated. We visited earlier this week with a group from a local professional society. 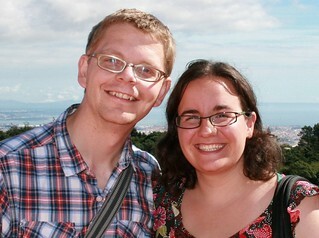 However, they also have open days (with the last one being in April). So if this is the kind of thing that interests you, do keep an eye out for notices. This entry was posted in Things To Do and Sights and tagged district heating, energy, fjernvarme, geothermal, wood by Ann. Bookmark the permalink.